A couple months ago I came across a neat legend about the Himbas tribe in Nimibia. The story is about how each person has a birth song sang throughout his or her life at various life stages and how that unique song is revealed to his or her mother before he or she is born. It is such a sweet story that I thought it would be fun to illustrate it and perhaps come up with an illustrated mock story book. I'm not sure where this is going, but I'll share my process online as a way to keep track of the progress of this project. 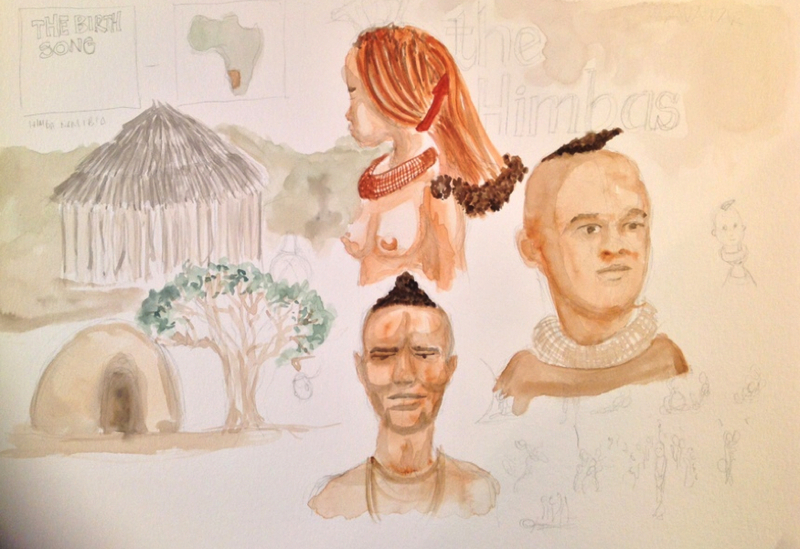 I started to do a little bit of research on the look of the Himba tribe and played around with watercolors. They have a really neat hairstyles representing different age groups and social status. Also their skin has a reddish tint to it because they usually cover themselves with a mixture of ochre and butter, believed to protect them from the sun. And then, when the mother is pregnant, the mother teaches that child’s song to the midwives and the old women of the village, so that when the child is born, the old women and the people around her sing the child’s song to welcome it. And then, as the child grows up, the other villagers are taught the child’s song. If the child falls, or hurts its knee, someone picks it up and sings its song to it. Or perhaps the child does something wonderful, or goes through the rites of puberty, then as a way of honouring this person, the people of the village sing his or her song. The tribe recognizes that the correction for antisocial behaviour is not punishment; it is love and the remembrance of identity. When you recognize your own song, you have no desire or need to do anything that would hurt another.